Hello and welcome to JT Hughes. Today I'll be showing you around one of our used Approved Hondas. This one is a Honda Jazz. This is the 1.4 litre ES model in Urban Titanium. As you can see, car comes in a very nice metallic colour, also has 15-inch alloy wheels. First registered on a 2012 62-plate. 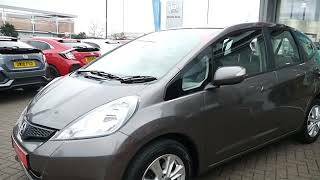 This Honda Jazz offers a fantastic sized boot, seats that fold down absolutely flat, and they can also fold upwards as well, offering quite a large amount of room in the rear, which I'll come and show you now. Nice place to be sat in the back. Very comfy cloth seats. That will just click into place, offering a large amount of room in the back. Finance is available on this vehicle, whether that be a hire-purchase agreement or a personal contract purchase, subject to terms and conditions and availability. You can also extend the warranty for £299, which will give you a 24-month warranty then. And also, service plans are available from JT Hughes. But enough of that. Let's have a look inside the vehicle. As you can see, very nicely kept. Height-adjust on the driver's seat. Now, this one comes with climate-controlled air conditioning, and also a CD/radio. Electric adjustable door mirrors, which also fold in electronically, as well. This one comes with a full service history, and will also come with a minimum of six months MOT. But for more information about this particular vehicle, and information on those flexible finance packages, please contact JT Hughes of Shrewsbury.